Bible lessons: the most important lessons. We've incorporated them into our early years homeschool for several years now, so as we begin formal lessons in the fall, I know that I want this time to feel different for Miss H. I want her to feel the importance of these lessons and that she's being entrusted with something big: real Bible passages instead of Bible storybooks. I've spent some time poring over Home Education to see what Charlotte Mason's recommendations are for formal lessons. While I am positive that Charlotte Mason had much more to say about Bible lessons in her other writings, I am solely focusing on her fist volume now. 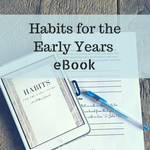 You can find the booklist I made based off of Home Education, and other posts in this series, here. This post contains affiliate links. You can read more about them in my policies. I chose the MacArthur Bible Commentary for this reason. Charlotte Mason also said that children should know many stories from the Old Testament, and a Gospel or two by the time they are nine. Because the heart of our faith is in Jesus, I think we will put a little more emphasis on the new Testament, reading an entire Gospel this year. Matthew Henry's Concise Commentary on the Whole Bible- This was published in the 1600's, so it is definitely not modern! J Paterson Smyth's Bible Commentaries, available here. John Macarthur's Bible Commentary- This is the modern commentary that we will use. We'll from the others as well since they're in the public domain. Not all of the Bible Commentary will be interesting and appropriate for a six-year-old, but I am personally excited about all that I'll learn through it! You can get the complete book list by subscribing above. Early Academics: To Wait or Not to Wait?